The weather is getting nicer. With the daylight savings, the days are getting longer. It looks like it’s finally time to get out of that winter rut. Just wanted to share a picture from yesterday’s ride. My friend Tom took me up the backside of Mt. 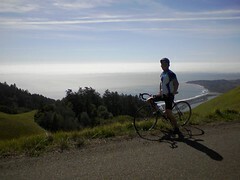 Tamalpais, and the view was awesome (the point in the background is Bolinas, a favorite surf spot). We’re starting to get into the swing of things and will be signing up for some organized rides this summer. Organized rides are a great way to get out and put some serious mileage on your bicycle and at the same time have the luxuries of support staff and pit stops. One ride that I’ve done the last couple of years is the Wine Country Century. It’s typically a 100 mile ride in the vineyards surrounding Santa Rosa, but there are also shorter and longer variations depending on how ambitious you are. The Wine Country Century is one of the easiest of Northern California centuries, so if you’re looking for a place to start, this is definitely it. If you’re looking to step it up a notch higher, it’s time to look at double centuries (yes, 200 miles in one day). I’ve yet to do one, but it’s been on my mind for the past couple of years. I am eying the Davis Double located at my Alma Mater. Aside from cycling, I’ve been getting settled at my new job. Things are going really well and I’m learning a lot each day.